Born in a well known Nair family in Trivandrum, Shri. K. Srikumaran, a Mechanical Engineer by Profession, has served in very high and senior managerial posts both in Private and Public sectors in such industrial Houses and Organisations as TVS, TELCO, the Walchand group, Steel Industrials Kerala (SILK) etc. He was General Manager and Managing Director of M/s Autokast Ltd., a Govt. of Kerala undertaking He has also served abroad on assignments and has traveled extensively in the country and abroad. After retirement, he had undertaken a pilgrimage to various temples in Kerala, South Tamilnadu, and S. Kanara dist. Of Karnataka and this travelogue in English highlights the various temples visited by him, their legends, festivals and special features. It is intended for those not well versed in Malayalam and the temple lore of Kerala, both in Kerala State and outside, in the country and abroad. This is his first attempt as author of such literary work. Ever since my childhood days, the legends and myths about the various temples of Kerala, my native state, have held a great fascination for me. This attraction can perhaps be traced to the development of the reading habit in my early years. I am greatly indebted in this respect to my mother the late B. Anandavalli Amma (Retd. Principal, College for Women, Thiruvananthapuram), for all her encouragement and the interest she took in ensuring the availability of varied and replete reading material, both in Malayalam and English, especially the poetic and prose versions of our various Puranas and epics like "Ramayanam", "Mahabharatham", "Bhagavad Gita" and the "Eithihyamala" by Kottarathill Sankunni, and many more. We had a veritable library of such literature and classical works in our house and I had ample opportunity to browse through and read these great works. This, perhaps, had kindled in me, even at a very early age, a yearning to visit and worship at these centres of our religion and culture. My mother also made me take up the study of Sanskrit from my early school years, which continued right up to my college days. The deep study and knowledge of Sanskrit stood me in good stead and enabled me to learn more about our ancient works, the epics and the teachings of great scholars and poets like Sri Adi Sankaracharya, Kalidasa and a host of others. Another person who exerted considerable influence in my early years and whose teachings continue to do so even today, was the late His Holiness Swami Thapasyandaji Maharaj (then the head of the Sree Ramakrishna Asramam, Thiruvananthapuram, and who later became the Vice President of the All-India Sree Ramakrishna Mission). I came under his tutelage and influence from the age of seven. It was he who moulded my mind with his teachings. I consider it a great honour and privilege to have had his guidance from such an early age. Swamiji was a brilliant scholar in Sanskrit, English and Malayalam and I can never forget the daily exclusive Gita lessons that he taught me. Under his learned eye, I could learn to memorise and recite all the 18 chapters of the Gita even before I had entered high school. Swamiji has been my spiritual preceptor in all respects. I consider myself extremely fortunate and blessed to have obtained "Mantradeeksha" (initiation) from him in my later years. One other factor that had its impact in my formative years was the Sabarimala pilgrimages that I undertook. It was in 1946, when I was 12 years old that I made my first trip to Sabarimala, which was one of the most profound experiences of my life. Two more trips followed in quick succession, after which there was a break of two years, as my college studies took me to Chennai (then called Madras). During my subsequent engineering studies at Thiruvananthapuram, I could make two more of these pilgrimages. There followed a long hiatus of nearly 25 years, as my career took me mostly outside Kerala. It was in 1976 that I resumed these annual pilgrimages, which continued till 1997, when I had to call a stop, albeit reluctantly, due to certain health problems. For these pilgrimages, I was fortunate enough in my younger days to have the blessings, love and guidance of two great "bhaktas" (devotees) of Sree Ayyappa, the late P. Kunjan Nair, who was a well known, revered an respected "Guruswami" for all Ayyappa devotees, and my uncle, the late K. Krishna Pillai (Retd. Secretary, Government of Travancore-Cochin). The part played by these two respected personages in my mental and spiritual development can never be forgotten. 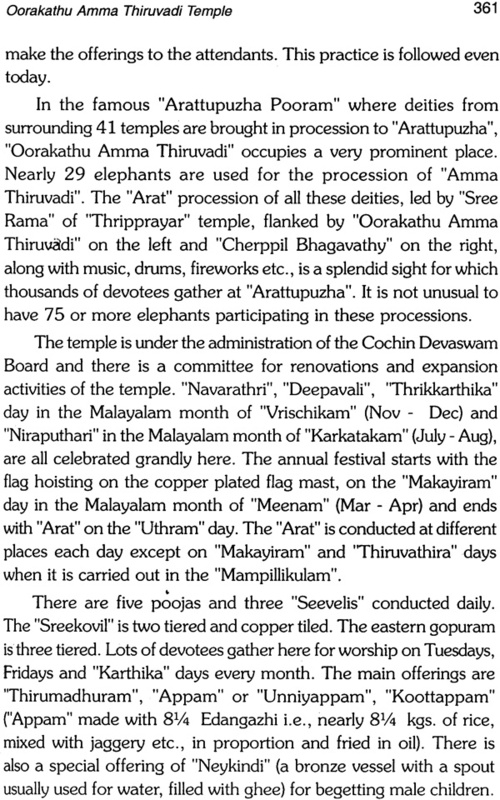 The sanctity of the "vratham" (penance) and the strict observance of the related rituals for these pilgrimages to Sabarimala for a minimum of 41 days or more, starting from the first of the Malayalam month of "Vrischikam", i.e., mid-November, to mostly the first week of the Malayalam month of "Makaram", i.e., mid-January, purified the mind of the pilgrims and prepared them for the rigours of the pilgrimage. It also helped in dedicating oneself solely at the feet of "Sree Ayyappa". The journey in those early days was very arduous and one had to trek nearly 40 kms. Through dense forests from Erumeli to Sabarimala, braving the elements and the untold dangers and obstacles. Only one's deep faith and trust in Sree Ayyappa and the unshaken belief that He would look after us gave one the courage and confidence to overcome all hindrances and finally arrive at the Sabarimala Sannidhanam (Sree Ayyappa's abode) in ht hills. The feeling of pure bliss and mental peace one experienced at the "Darshanam" of "Sree Ayyappa" after the observation of the ritualistic "vratham" and the strenuous journey, is beyond description. As a person who has gone through the divine experience of these pilgrimage, I cannot but draw a comparison between then and now. The solemn "vratha" and its related rituals are no longer strictly observed by a large majority of pilgrims as accessibility to the shrine has become easier. Where it used to take many days of planning and to undertake the actual trip in the past, one can nowadays go to Sabarimala and return the same day from almost anywhere in Kerala and may be a few additional days from the neighbouring states of Tamil Nadu, Karnataka and Andhra Pradesh. The sublime devotion that grows in one as one treks through the forests, that one is surrendering oneself to "Sree Ayyappa", have given way to mechanical gestures and crass commercialism. Where there were once dense forest glades and pure and sparkling streams and rivers, there are now denuded lands and human-made concrete jungles. The rivers have been polluted and contaminated to such an extent that they pose serious health hazards. The serenity and sanctity of the pilgrimage with its relaxing and enjoyable though strenuous trek and the divine and soul satisfying "Darshanam" of "Sree Ayyappa" at the end, have been replaced by a hurried trip that does not give one breathing space or mental peace that results from the devotional aspects of the trip as in the past. To cap it all one gets only a brief glimpse of the deity nowadays after waiting for hours. The whole pilgrimage has become mechanical in its rituals and has been highly commercialized so much so that the devotional aspects have taken a back seat and have been sidelined to a great extent. I have digressed to touch upon the above aspect in little detail to emphasise my belief that pilgrimages are not to be treated as picnics for enjoyment. They should be approached with firm determination, devotion and faith. We must realize that, surrounded as we are today by worldly pleasures and other diversions, temples are the only places with serene and calm surroundings where we would be able to concentrate on the glory of our Creator and seek His blessings and mercy. This is true of every place of worship of every religion, be it a temple, church or mosque. Coming back to the subject of my pilgrimages, the background described briefly above and the foundation laid during my younger days continued to influence me throughout my life. Even though I had turned skeptical a little later, the spark that was ignited in my younger days was never extinguished, thanks again to my mother. 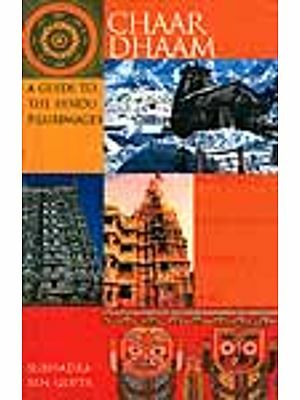 As I was mostly away from Kerala during my career, I had little or no opportunity of pursuing and fulfilling my wishes in undertaking the pilgrimages to the various temples in the State even though a comprehensive list of the temples to be visited and a rough itinerary had been formulated as long as 30 years ago. It is only after settling down in Thiruvananthapuram a few years ago that I could revive my thinking and plans in this respect. My pilgrimages started in January 2002 and entailed a period of four months that year and another two in 2003. A total of 12 trips were made during these periods, covering a range of temples from Kanyakumari to Mookambika, except for those in the districts of Kozhikode, Kannur and Kasargode. The details are furnished in Chapter II. While recording my visits to these temples and their legends, it may be worthwhile to mention here some of the difficulties experienced in locating some of the places of worship. 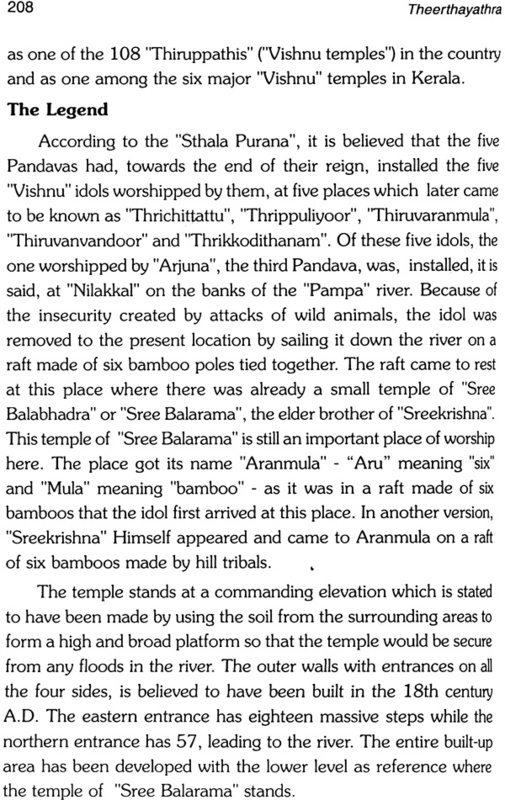 This was especially the case in the Malabar area where many temples lay out of the way from the main cities or towns. 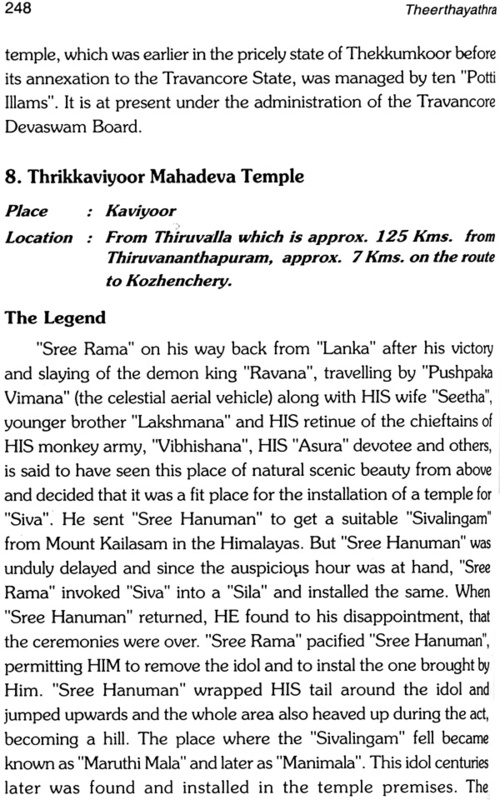 Though there are some indications and directions on these aspects in books like the "Eithihyamala" and the "Temples of Kerala" (by Puliyannoor Radhakrishnan and published by Navagraha Publications, Thiruvananthapuram), no route maps or exact locations are available except in some cases. Even signboards are not available for many a temple on the roads and we had to often stop and ask repeatedly for proper directions. Since I am no cartographer, I have not tried to provide any detailed routes or maps. I have only attempted to indicate important to indicate important landmarks, wherever possible, which I hope will be of help to those who desire to visit these places of worship. 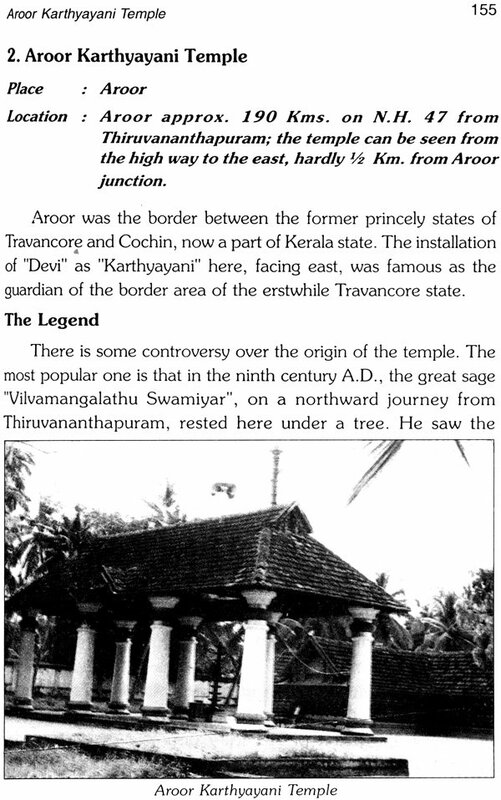 I would, therefore, conclude with a request to the authorities like the Travancore and Cochin Devaswam Boards and the governing bodies of the temples in the Malabar area to publish complete lists of the temples of Kerala, along with a route/location temple map. The maps could indicate distances from principal cities, nearby towns and district headquarters, names of "panchayats" where these temples are situated, the travel services available and so on. I am sure if the authorities do attempt such a voluminous, but necessarily studious and enlightening work or entrust it to any leading writer or groups of writers with adequate funding, it would be an invaluable and yeoman service to the society that they are trying to serve. 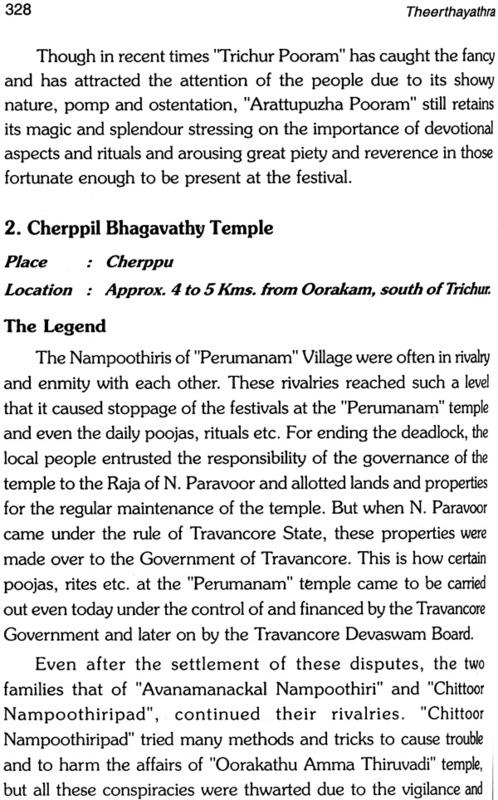 Such an encyclopedia of temples can be divided into convenient volumes based on districts and should be published both in Malayalam and English so as to benefit pilgrims and tourists alike not only from Kerala but from other states and abroad as well. The work could also be made available at affordable and if necessary subsidized prices or at cost to all, including schools, colleges and other libraries, so as to enable future generations to learn about these renowned centres of worship and ancient culture. Inclusion after, if necessary, a detailed research and study of the myths and legends about these temples  about which many have only sketchy or distorted knowledge  will greatly enhance the value of such a literary volume and help to establish a better understanding of our heritage and culture. On hearing about our trips, many of my relatives and friends requested and advised me to write about these pilgrimages, including the legends about these temples, so that my experiences can be shared by those who have not had such opportunities. I found their opinion, that these temples and the legends connected with some of them might not be truly known to many, especially among the younger generation, to be very true during the course of my discussions and conversations. I was also advised that I should present my experiences in English, as many Keralites, specifically those long settled outside the state and abroad, may not be very proficient in Malayalam and, therefore, an English presentation would give them a chance to get better acquainted and know more about our temple culture and heritage. 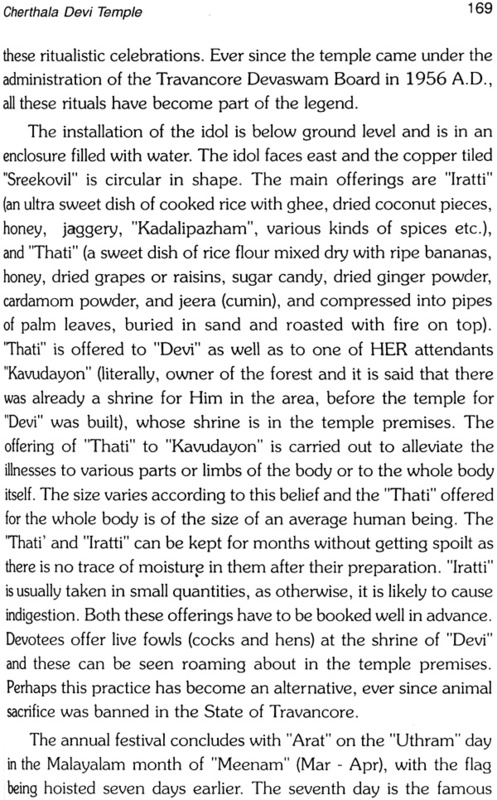 Similarly I hope it may be of help to non-Keralites who are interested in learning more about these temples and their customs and traditions. This travelogue is the result. I do not claim to be an accomplished writer. I have only tried to record our visits to these places of worship. Some of these are thousands of years old, and have been centres of education, learning and culture in the days of yore and the pivots or fulcrums around which our ancient societies have grown and prospered in bygone days and eras. 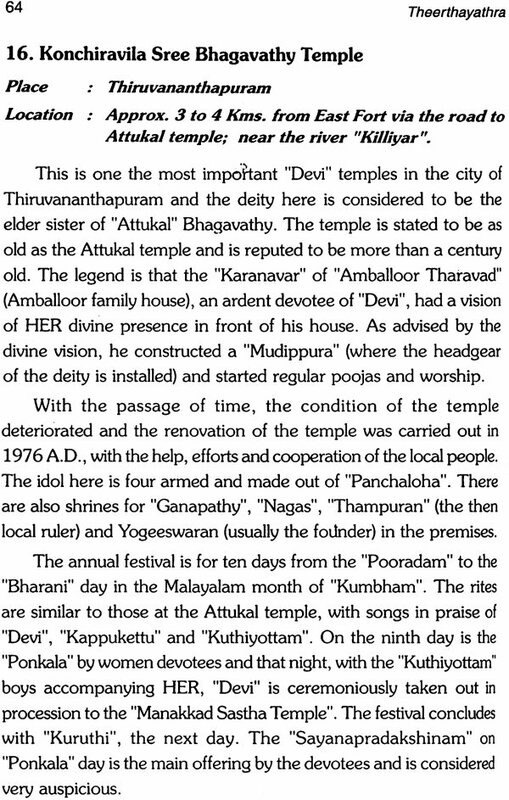 Photographs of some of the temples find a place in this volume by courtesy of the volumes "Keralathile Kshethrangal" by Puliyannoor Radhakrishnan and "Thulasi Garland" by Her Highness Aswathi Thirunal Gouri Lakshmi Bai. Temples which are places for worship of God occupy an august place in all religions. Man who has seen around him vast devastations caused by storm, earthquake, volcano etc. and who has met with dualities like loss and gain, success and failure and so on in his own life could not arrive at a proper explanation for these uncontrollable phenomena. He pondered over it again and again and gradually accepted the presence of a mighty unseen Power which controls both the individuals and the Universe. The reflections and meditations on this great Power led to the sublimations of his mind which eventually gave him a quietude, a transcedental bliss, never experienced before. He wanted to worship this unseen Omnipotent Power and temples came into being. So the deities that we find in the temples all round the world are the symbols of this mighty unseen Cause of the Universe, by worshipping which man attains composure of mind and that consequently leads to Self - Realisation. The temples play an important part in creating true devotion and inculcating good values, not only in the minds of elders but also among children - the tiny - tots, who if guided properly right from the beginning by their parents by leading them to nearby temples and showing them how to pray, circumambulate, prostrate before the deity, respect elders, etc., are sure to inculcate good habits in their impressionable age and to become worthy citizens of our motherland. Our religion of "Sanathana Dharma", wrongly yet popularly called Hinduism, has been the subject of devastating criticism, not only by members of other religions but by Hindus themselves. The accusers are vociferous in their vitriolic, vituperative criticism on the multiplicity of Gods. Their contention is that people can attain better concentration of mind if one God is worshipped. The reply to such accusers is that they have not cared to know that the basic creed of "Sanathana Dharma", the mother of all religions, is : ( meaning: - The Truth is One. It is perceived and spoken of in different names and forms.). This has been aptly quoted by the author in the front page of this book. 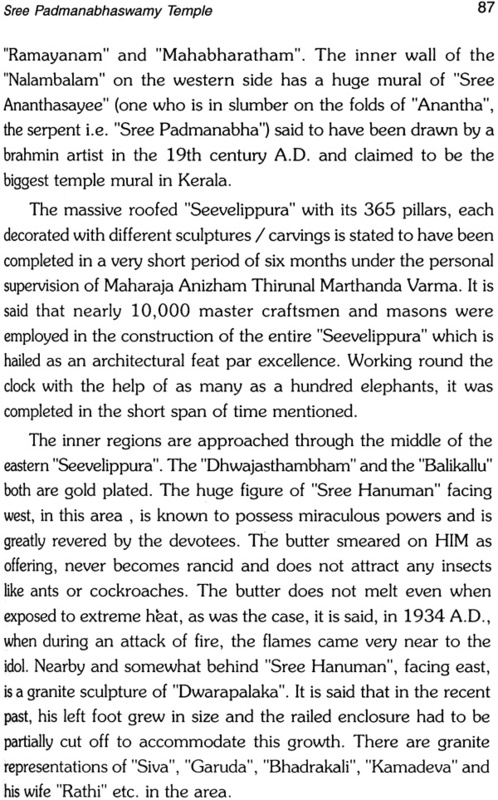 In "Sanathana Dharma" this Truth was named "Brahman", meaning the largest thing conceivable by man. It has no form but it began assuming forms to suit the temperamental requirements and predilections of the human mind. Thus the actionless "Brahman" became active "Iswara", in whom was vested the creation, preservation and re - absorption of the visible universe. 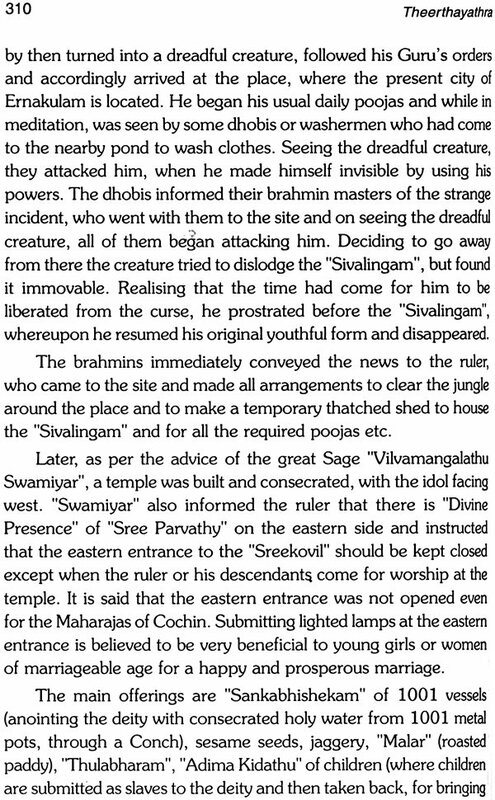 Gradually the concept of "Iswara" was resolved into (i) "Brahma", the creator, ( ii ) "Vishnu", the preserver ( iii ) "Siva", the re - absorber. The energy counterparts of these personal conceptions are (i) "Saraswathy", the Goddess of Knowledge, (ii) "Lakshmi" ,the Goddess of Wealth and (iii) "Uma" , the Goddess of Energy, respectively. Man was not satisfied with this arrangement for creation of the universe. He decided that to control the universe in its varied activities "Iswara" should have an administrative set - up. So minor Gods began to spring up in his fertile imagination and they were given the control of different activities. Man began to worship all these Gods and sub - Gods and temples were constructed by sages for his worship and also to instil fear in his mind and lead him on the right path. In conclusion it may be mentioned that while worshipping the subtle force behind it, the wise man knows that the Truth that pervades the entire universe is One, but spoken of variously. Let us hope that those who cavil at Hinduism as a polytheistic religion would try to understand this art of God - symbolism in Hinduism. So, accepting that temples are a ‘must’ for inculcating good values in the life of people, it becomes the bounden duty of the people of our land to protect temples which are a part of our heritage, to renovate those which have succumbed to age, to construct new ones where there are none at present and to make their presence known to the people at large. An assessment of the existing temples must be made to educate the people and to guide them. 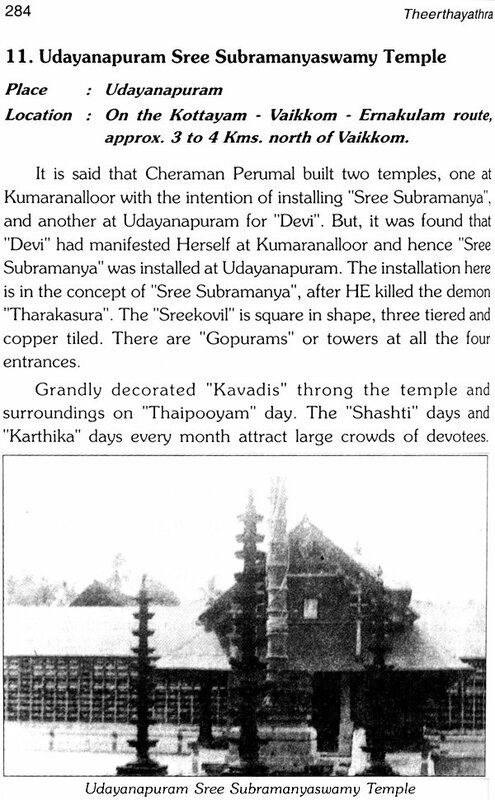 We have seen the voluminous publication on “Temples of Kerala” by Shri S. Jayashankar, issued by Census Dept., covering all aspects of temple architecture and rites, and the publication, “Thulasiharam” by Aswathi Thirunal Gouri Lakshmi Bai, giving an account of the temples in Travancore. Here is an attempt by Shri K. Srikumaran, an engineer by profession, who, after holding very high posts in the State Public sector and Private sector, ordained by God as it were, has chosen this humanitarian field on retirement. 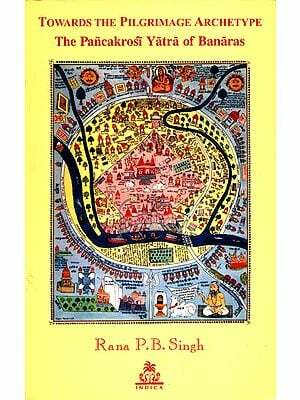 His facile expressions in this book of pilgrimage through various temples, couched in lucid language makes the reading as interesting as a story or novel. I am sure, the book will be a blessing not only to Keralites but to devotees of other states in India as well, nay, other countries too, who have firm faith in the one Infinite Reality. The writing is all the more pleasing and endearing, when we find that it emerges from a person, who, though religious minded and God- fearing in h is younger days, had turned skeptical in his youth and was brought back to the path of spiritual sanity by his better half. The book is, therefore, the expression of firm conviction in the Supreme Reality. May the Almighty shower His benign blessings on Shri Srikumaran and his family, give him the fortitude to brush aside all hurdles and lead him through the pleasant path chosen by him.